The video below shows six natural slug control tips and ideas you can use in your own garden or yard to deal with these pests. Not all of the ideas are also organic slug control tips, but many of them are. Tend your garden, and the plants living in it, regularly, and you will not have as much of a slug problem. 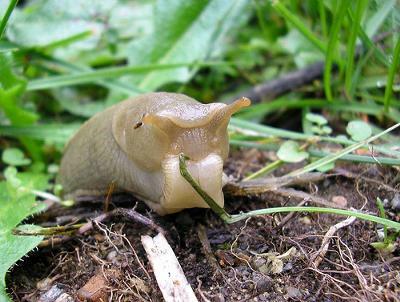 Slugs like to eat dead and dying plant material, mainly, so remove this type of material and you will remove the food source that attracts them. Plant rough and spiky plants as a means of organic or natural slug control. Slugs, as you can see from the picture, have very soft underbellies, which make them vulnerable to sharp objects. The first of several tips exploiting this characteristic of the slug is to encourage spiky plants to grow in your garden, because slugs have a hard time crawling on and around them. Another way to get rid of slugs is to move around the soil with either a garden fork or hoe, which tends to make the soil a bit dryer. This will discourage slugs, who like it moister. garden centers, can be wrapped around potted plants. These rings naturally deter slugs, because they cause the slug to get a mild electric shock (which is non-lethal) when it tries to crawl over the ring onto the potted plant. Who knew slugs loved to booze it up? Actually, the beer trap's scent attracts the slug who crawl in and then drown in the beer. Therefore this is one way to actually kill slugs in your garden, as opposed to just deter them. The video explains exactly how to use a beer trap, including how to make your own. Similar to using spiky plants, as suggested above, you could also spread horticultural grit or sharp sand around any plants you want to protect with this natural slug control technique. The slugs don't want to crawl over it because of their soft underbellies, so it deters the slugs from crawling on those plants. Here is the video for full details of all the natural slug control tips discussed. Tell me in the comments how these tips worked for you, or any other ideas you have for natural or organic slug control. In addition, you can share your own home remedy pest control tips here, and read tips and ideas already submitted.